Does the above picture look scary to you? 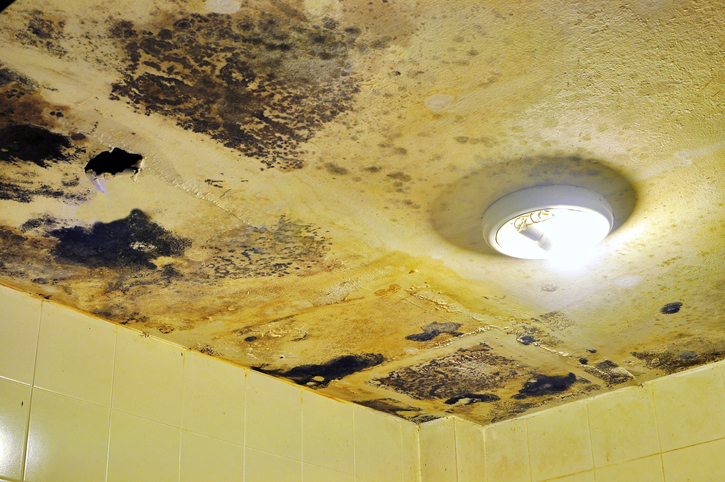 Though that damage is extreme, it’s exactly what can happen when roof leaks are left unchecked. Luckily, most roof leaks are preventable—and many can be spotted easily with a quick inspection. Here are a few steps you can take today to keep your roof in the best shape possible. Your roof has shingles for a reason. Cracked, bent, and missing shingles all provide an opportunity for leaks. You might see this manifested as shingle debris in your yard, driveway, or downspout splash blocks. Or you might notice off-colored patches on your roof. If you know a little bit about home repair, and feel comfortable walking on your roof, you should be able to repair a missing shingle by yourself. A cracked shingle can be repaired using a little bit of roof sealant squeezed into the opening. However, if part of the shingle is missing, you’ll need to use a hammer to remove the nails, and then a pry bar to pull up the shingle itself. Then take a utility knife and cut the shingle free. Slip the new shingle into place, and the nail it down with four fasteners. Sounds too complicated? A roofing professional will be happy to make the repair for you. If you notice pools of water standing on your roof after it rains, you could have a big problem on your hands shortly. Ponding, as this circumstance is known to roofers, leaves you vulnerable to rot, which in turn can cause all kinds of issues, including leaks. Flat and low-sloped roofs are obviously more prone to this problem than steeply-pitched surfaces—but it can happen anywhere. If you see ponding on your roof, call a roofing company as soon as you can. They’ll likely have to replace your roof and decking, but it’s better than having to replace any number of water-damaged possessions after a roof leak! Gutters serve the practical purpose of carrying rain runoff away from your roof and siding. So if yours are clogged and can’t function properly, you’ll see more standing water and moisture on roof surfaces, meaning there’s more chance for leaks. To keep your gutters running clean and clear, use a trowel to scoop out leaves and other debris, and then take a garden hose and rinse them until they run clear. Be on the lookout for leaks and rusted or twisted gutters that could present problems down the line. Repeat this process twice a year, after fall and spring. Any place where there are openings or joints in your roof, there’s the potential for leaks down the line. Unfortunately, these punctures are unavoidable, since your roof’s vents, and your home’s chimney and pipes have to have somewhere to go. Additionally, if you have skylights or solar panels, your installer likely had to make punctures in your roof to put those in, as well. Installers and roofers protect these joints by adding flexible metal called flashing around joints and openings. However, if this flashing becomes bent, rusted, or loses its seal, it can expose your home to leaks—especially because some protrusions, like chimneys, are joined to homes with mortar. Mortar is merely a mixture of sand and cement, so it can be washed away quickly when exposed to rain. If you see grit or sand in the gutters, that’s a sign that you may have a problem in the works. Often, leaks can happen within walls, so they’re not always immediately obvious. However, you should have your roof inspected by a professional roofer at least every five years (or more frequently, if your roof is over ten years old) to keep problems like this at bay. Another way to spot leaks is through the damage on your attic ceiling. If you notice damaged or moldy insulation, rotting or stained boards or ceiling panels, or puckering, discolored sheet rock, you may have a leak on your hands. If you see any of these signs, call a roofer right away. They can send an inspector out to look at your roof and give you some recommendations for what to do next. If you live in an area with frequent ice and snow, you could experience issues with ice dam buildups. This usually occurs after a snowfall—the interior of your home is warm from your heating, and that heat rising melts the snow on the top of the roof. However, when that snowmelt hits the edges of the roof where the temperature is cold, it refreezes, clogging your gutters and stopping runoffs. Or it could cause icicles to form, which can be extremely dangerous. By now, you’ve probably gathered that excess moisture is the enemy of a happy roof. So anytime you have water sitting on the roof, you’re setting yourself up for eventual leaks. You can prevent ice dams manually using a roof rake to scrape off the snow and ice. However, if you want to really hit them where it hurts, you may want to consider taking another look at your attic insulation. If your attic is insulated to the proper R-value, heat loss like this should be a nonstarter—meaning you won’t have to deal with ice dams at all. And you’ll be warmer all winter long—and free of leaks. Your peace of mind is as simple as a few preventative measures.